The year is 1980 and Japan is ablaze in youthful energy. 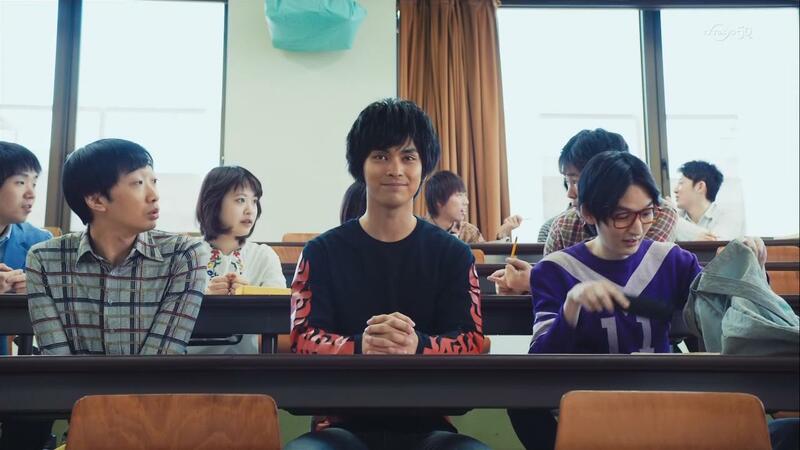 Moyuru Honoo is a first year art college student utterly sure he is destined to set the world ablaze with his talent as a director in anime or as a manga author. The first assignment given to Moyuru Honoo is to create a flip book. He’s sure his flip book is so awesome that it will stun the class; but, the quiet kid in the corner produces one that utterly destroys his. The quiet kid’s name is Hideaki Anno, the guy who will rock the world when his series Neon Genesis Evangelion is released in 1995, and Moyuru Honoo becomes obsessed with somehow beating Hideaki Anno. 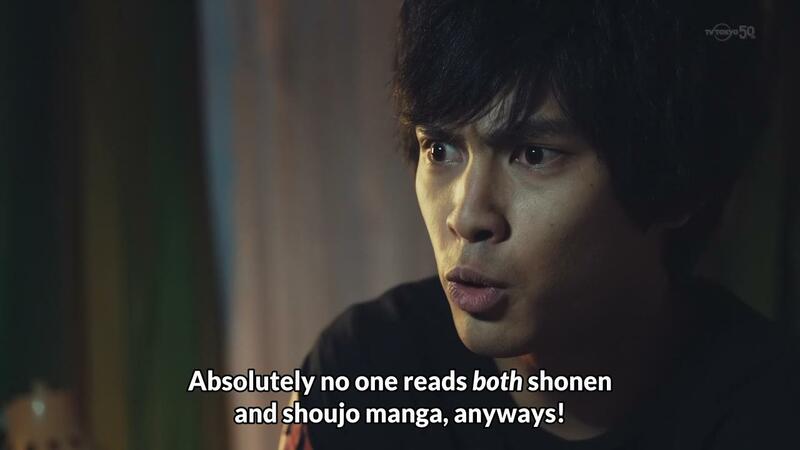 Aoi Honoo aka Blue Blazes is based on a manga by Kazuhiko Shimamoto who based the work around his own real life experiences. It’s this autobiographical dimension that immediately jumps out to any viewer even remotely an anime fan. It’s utterly and completely awesome to see slightly fictionalized versions of such a recognizable group of people from the fields of anime and manga back when they were college kids dreaming of the future we’re living in now. Anyone above the level of casual anime/manga fan will find this series worth watching just on this facet alone. 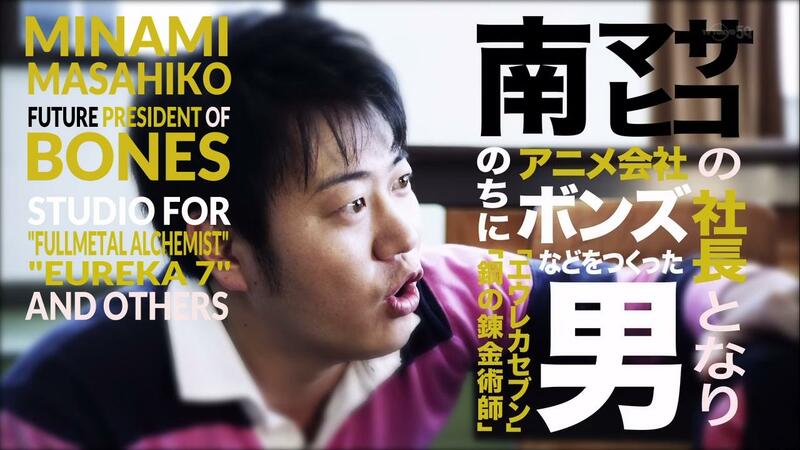 This guy is a Gainax founder and it’s first president. 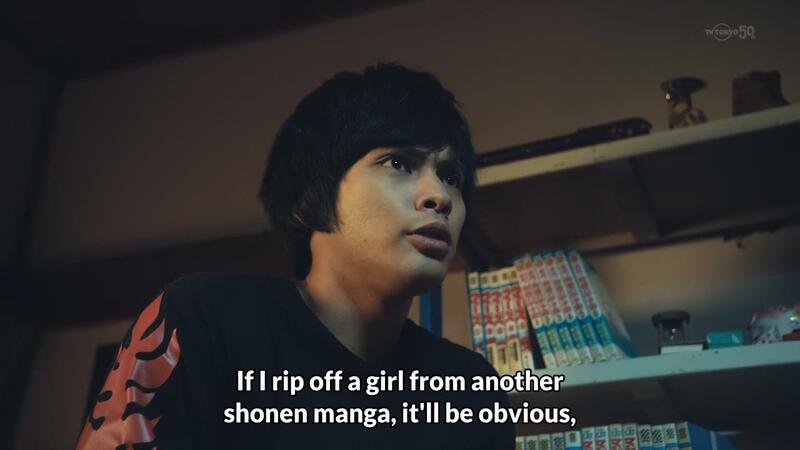 Of course, there’s more to like about Blue Blazes then just that. Completely separate is the actual content of the story which is a coming-of-age story, set in college, of how Moyuru Honoo grows from a kid with a dream to an adult capable of realizing that dream. Just like how the game ping-pong wasn’t really integral to the story of Ping Pong, anime/manga is not integral to Aoi Honoo. This facet also really works. The characters are interesting and likeable and it’s easy to care about what happens to them. The storytelling is exceptional with pitch perfect pacing and plotting. 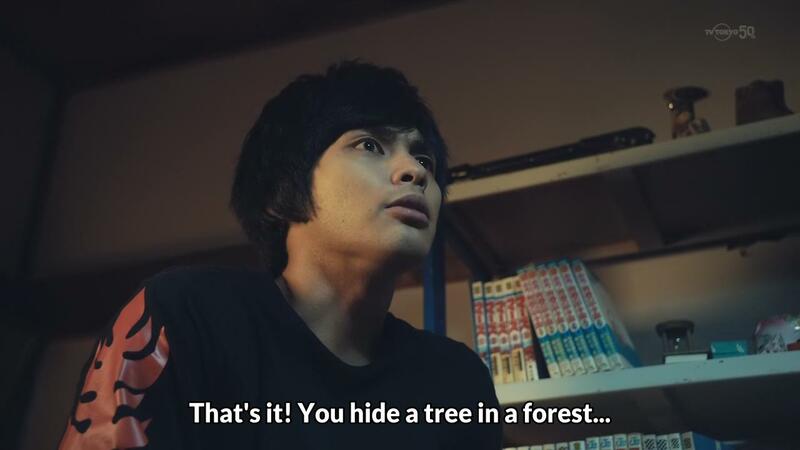 Speaking of characters, it’s fascinating to see how anime-ish a live action series can be. 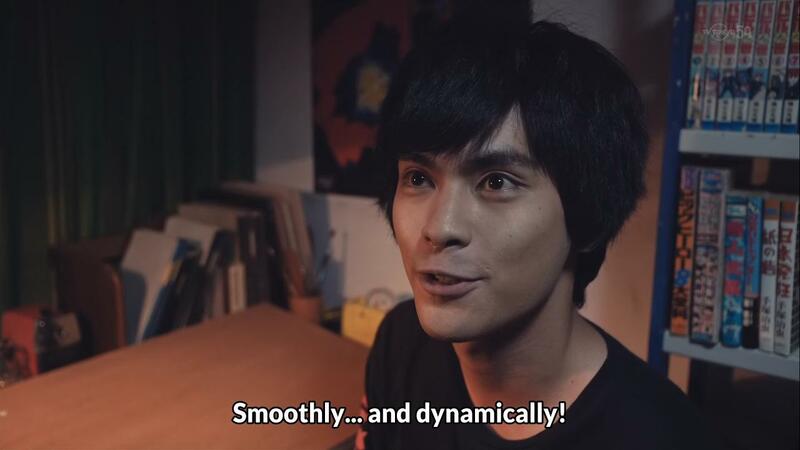 The passion Moyuru Honoo feels about anime and manga overflows with exuberance and the actor that plays him, Yuya Yagira, doesn’t let a silly thing like being an actual person get in the way of creating the most hilarious expressions to match that passion. 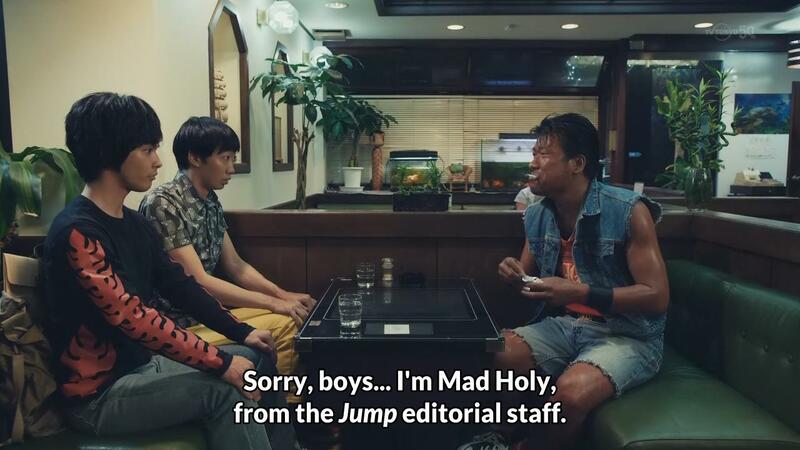 Mad Holly is a manga editor that shows some interest in Moyuru Honoo’s work and he could literally be a quirky side character that stepped out of a manga or anime due to how over the top he is portrayed. And just like how sidekick characters are drawn in such a way that they’re obviously the sidekicks, Aoi Honoo’s sidekick characters are all obviously meant to be as well. The main character, Moyuru Honoo, also imagines that he’s part of a love triangle, like you’d see in an anime or manga, with the two women that show him an ounce of interest – I seriously doubt either woman is interested in him in that way in actuality. 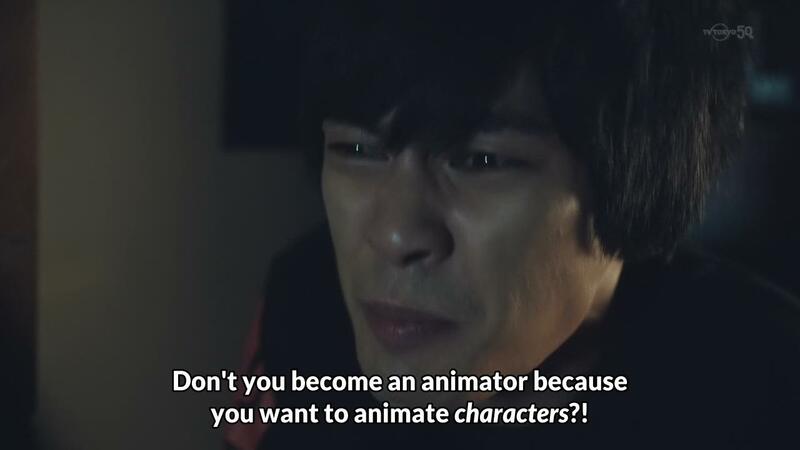 The comedy of Blue Blazes uses this anime-ish dimension to great effect but doesn’t rely on it. The actors have their comedic timing down and the director obviously is a pro at creating a comedy. 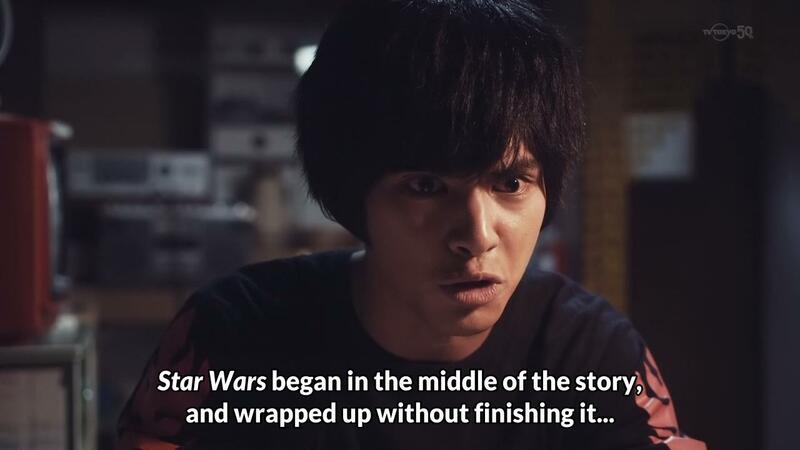 And there’s also the writing; some of the things that are said are flat-out hilarious before you factor in the actor’s delivery, background music, etc..
One of the things I was surprised to find was, even though the show is set in 1980, I understand many of the anime and manga references. I have not seen a great deal of anime from pre-1995 but there’s been a few newer works that have helped. Last year’s remake Space Battleship Yamato 2199 meant I get the references to Space Battleship Yamato. Moyuru Honoo looks up to Mitsuru Adachi a lot and, having seen the recent baseball anime Cross Game which was a later work of Mitsuru Adachi, I get those references as well (in part because Mitsuru Adachi has apparently been writing successive baseball manga series since the late 1970’s while using the same looking characters over-and-over again). 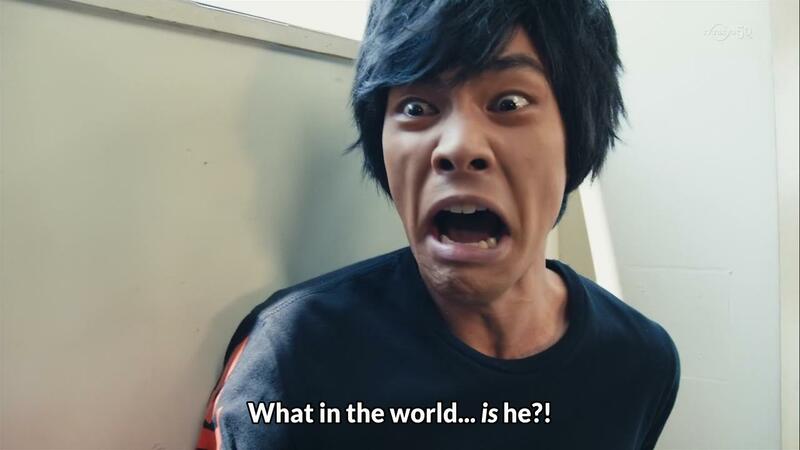 Being able to enjoy Blue Blazes as a live-action series when I’m so used to watching anime wasn’t as tough of a sale to me as I thought it would be; though, it did remind me how anime has to streamline things to come under budget and how it copes in doing so. 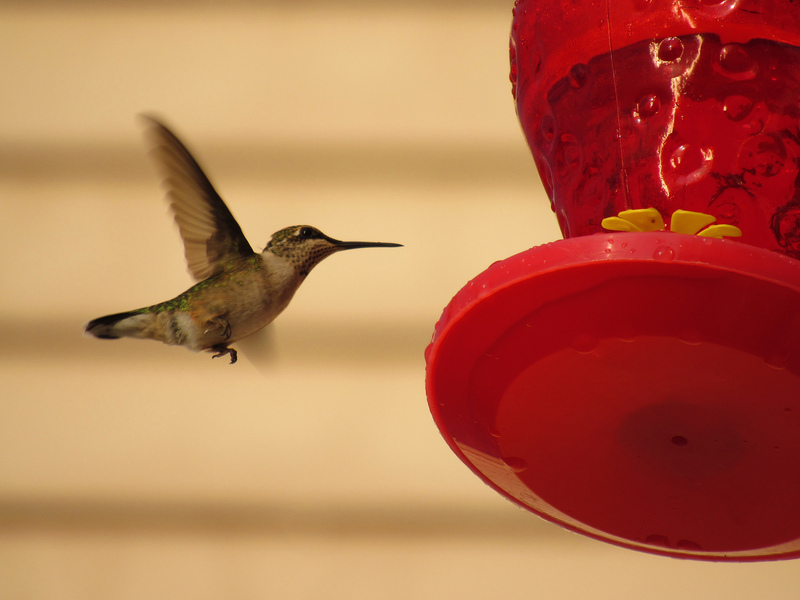 I found out I had to turn some of my analytic subroutines – I’d guess you’d call them – off as I watched it. For instance, I found myself marveling on a few occasions about how the people in the background were in constant motion because I’m used to using that as a convenient tool to help measure the quality of an anime’s animation – and then I’d remember I’m not watching an anime 🙂 . At times it feels slightly weird to always see the full real background instead of, say, a monochrome background with speed lines drawn in or to always see all the items in a room or classroom instead of just a few key items, which is common in an anime. This hasn’t hindered my enjoyment of the series but has given me a chance to think about anime from a different angle. 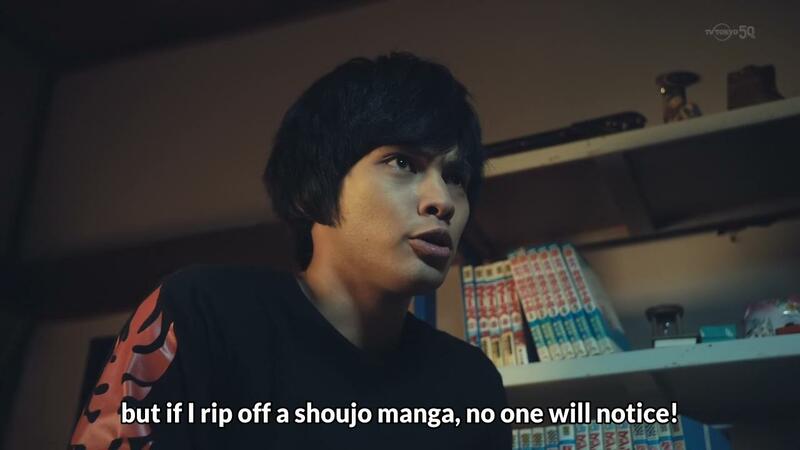 It might just be me; but, I mention my reaction towards a live-action Japanese TV series here because most readers will are probably be in the same boat as me, being more versed in anime, and I want to allay potential reservations. 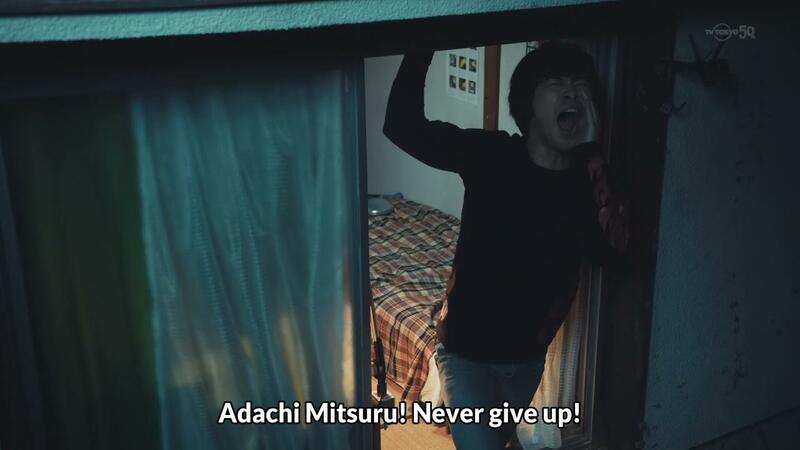 Thusly, hopefully I’ve presented a persuasive case to go watch Aoi Honoo (Blue Blazes) right now. If not, there’s also a pretty good OP/ED to the show and the background music is used to good effect as well. 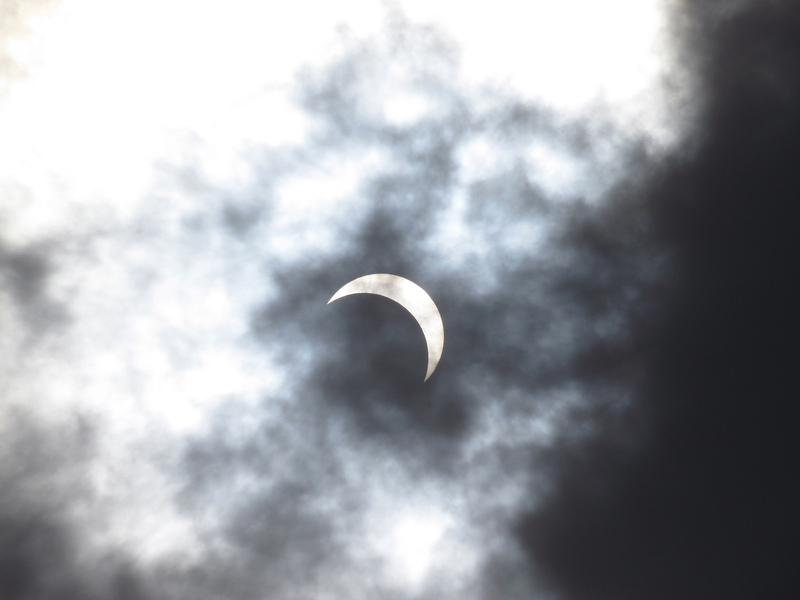 I also have more screenshots and a few gifs I could add. What great hair they have in those images! Where are you watching this? I would like to check it out and I am really not into live-action Japanese works but this intrigues me. 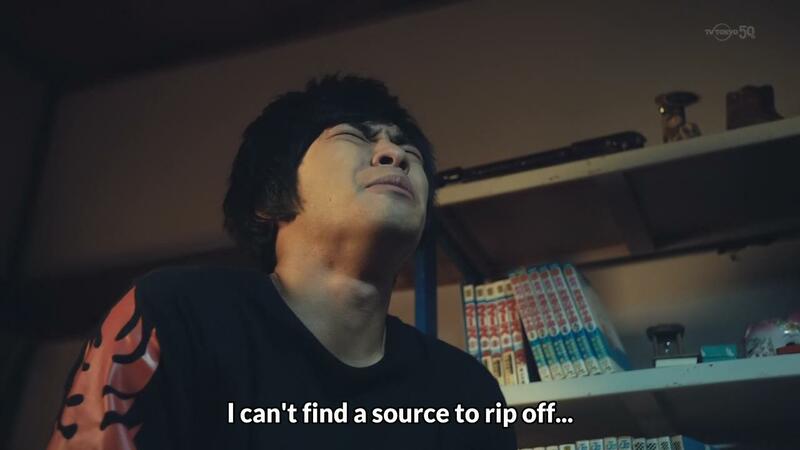 There was a time when I’d be all secretive about it but if the last few years have taught me anything it’s that piracy helps official-only fans, eventually, so I don’t know if you do fansubs or not but Over-Time subs this series, and a few other live action series, and they offer it on their website as either a direct download or torrent. I’d like to chance to watch this legitimately; it’s the type of show that should have been licensed on Crunchyroll.